The sequin pillow is a perfect addition to add some sparkle to your living room, bedroom, den or any room. Great for everyday use as well as Thanksgiving, Christmas and New Years, or for your wedding/party lounge decor! 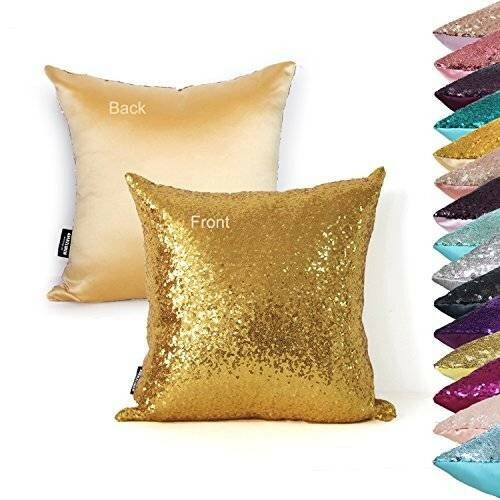 Our sequin pillow covers are made of high quality sequin fabric and mistique satin, focusing on ensuring a good finish instead of bulk manufacturing. Each piece is over-locked to avoid any raw edges. We offer various colors:Champagne blush, purple,pink,mint,rose gold,light gold,gold,silver,white,black,fuchsia,teal,light peach,eggplant and so on. CARE INSTRUCTIONS: Dry wash or hand wash gently. Do you want a Pillow Cover that will still look and feel soft night after night? Do you want a Pillow Cover that not only looks good, but stays looking and feeling good after you wash it. Have you heard of AMAZLINEN? We are the number one and most recommended source online for superior quality pillow cloths and bedroom accessories. As our name suggests all our Linen is Amazing. Our AMAZLINEN pillow cases are made from some of the highest quality and premium calibre material you will find anywhere online. They blend in perfectly in every room of the house and will fit snugly on all your soft pillows. 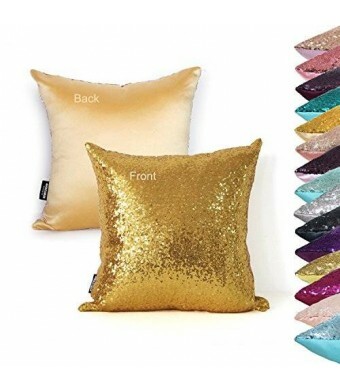 So there is no need to look any further because we have all that you will need to make your pillows look stunning!